Spontaneous brain activity, typically investigated using resting-state fMRI (rsfMRI), provides a measure of inter-areal resting-state functional connectivity (RSFC). Although it has been established that RSFC is non-stationary, previous dynamic rsfMRI studies mainly focused on revealing the spatial characteristics of dynamic RSFC patterns, but the temporal relationship between these RSFC patterns remains elusive. Here we investigated the temporal organization of characteristic RSFC patterns in awake rats and humans. We found that transitions between RSFC patterns were not random but followed specific sequential orders. The organization of RSFC pattern transitions was further analyzed using graph theory, and pivotal RSFC patterns in transitions were identified. This study has demonstrated that spontaneous brain activity is not only nonrandom spatially, but also nonrandom temporally, and this feature is well conserved between rodents and humans. These results offer new insights into understanding the spatiotemporal dynamics of spontaneous activity in the mammalian brain. Multiple lines of evidence indicate that spontaneous brain activity plays an essential role in brain function (Raichle and Mintun, 2006; Zhang and Raichle, 2010). For instance, intrinsic neuronal signaling consumes the vast majority of brain energy (Raichle, 2006, 2010). Investigation of spontaneous brain activity, predominantly conducted using resting-state functional magnetic resonance imaging (rsfMRI) (Biswal et al., 1995; Fox and Raichle, 2007), has provided critical insight into the intrinsic organization of the brain network. Using spontaneously fluctuating blood-oxygenation-level dependent (BOLD) signal measured by rsfMRI, resting-state functional connectivity (RSFC) between brain regions can be gauged by statistical interdependence of their rsfMRI signals over the period of data acquisition (Fox and Raichle, 2007). Based on this quantity, multiple brain networks of functionally-related regions have been identified in both humans and animals, which convey the information of stable functional connectivity organization of the brain (Beckmann et al., 2005; Fox et al., 2005; Damoiseaux et al., 2006; Smith et al., 2009; Allen et al., 2011; Liang et al., 2011). Conventional rsfMRI studies generally focus on steady features of RSFC by assuming that RSFC is stationary during the acquisition period. However, meaningful temporal variability of RSFC at shorter time scales has also been discovered (Chang and Glover, 2010). This initial research and its follow-up studies revealed dynamic properties of RSFC, indicating that the stationarity assumption of RSFC would be overly simplistic for understanding spontaneous brain activity (Hutchison et al., 2013a; Preti et al., 2017; Chang et al., 2016a). Indeed, using sliding window analysis and clustering methods, temporally alternating but spatially repeatable RSFC patterns have been identified (Allen et al., 2014). In addition, Liu and Duyn (2013) developed a method that examined instantaneous co-activations of BOLD signal at single rsfMRI frames and found that BOLD co-activation patterns well corresponded brain connectivity configurations (Liu and Duyn, 2013). With this method, the default mode network, which is a single network under the assumption of stationary RSFC, can be decomposed into multiple sub-networks with distinct spatiotemporal characteristics and functional relevance (Liu and Duyn, 2013). Notably, the neurophysiologic relevance of dynamic RSFC has been validated in multiple studies using simultaneous electrophysiology and rsfMRI acquisitions (Tagliazucchi et al., 2012; Chang et al., 2013; Keilholz, 2014; Liu et al., 2015b). In parallel with blossoming dynamic RSFC studies in humans, dynamic RSFC studies in animal models have also been conducted. Animals’ brain preserves fundamental organizational properties as the human brain (Liang et al., 2011; Ma et al., 2016), and can serve as a translational model for studying complicated brain dynamics. Using either the sliding window or co-activation pattern approach, dynamic RSFC patterns have been found in both awake and anesthetized rats, as well as in anesthetized monkeys (Majeed et al., 2011; Hutchison et al., 2013b; Keilholz et al., 2013; Mohajerani et al., 2013; Liang et al., 2015; Grandjean et al., 2017; Ma et al., 2017). These results suggest that dynamics in RSFC might be a general feature in the mammalian brain. Despite the critical advancement, aforementioned dynamic rsfMRI studies have mainly focused on revealing the spatial characteristics of RSFC patterns that were non-stationary, while the temporal relationship between these RSFC patterns is still unclear. Particularly, although the existence of temporal transitions between characteristic RSFC patterns has been established, it remains elusive whether these transitions are random or organized in an orderly manner (Majeed et al., 2011; Zalesky et al., 2014; Mitra et al., 2015; Preti et al., 2017). Lack of such information highlights a gap in elucidating the temporal relationship of separate brain connectivity configurations, and thus hinders the comprehensive characterization of spatiotemporal dynamics of spontaneous brain activity. To address this issue, in the present study we studied the temporal transitions of intrinsic brain activity in both awake rats and humans. The reproducibility of the RSFC pattern transitions was examined. In addition, the organization of RSFC pattern transitions in rats and humans were respectively studied using graph theory analysis. RSFC patterns that were pivotal in temporal transitions were further identified. In this study, we investigated the temporal transitions between spontaneous brain activity patterns in awake rats and humans. In rat data, we first obtained a library of 40 characteristic RSFC patterns, using seed-based correlational analysis with seeds defined by parcels in a whole-brain RSFC-based parcellation (Ma et al., 2016). These characteristic RSFC patterns were used as the reference patterns. Subsequently, based on the notion that the BOLD co-activation patterns of single rsfMRI frames represent their RSFC patterns (Liu et al., 2013; Liu and Duyn, 2013), each rsfMRI frame was matched to one of the 40 reference RSFC patterns that had the highest spatial similarity to the BOLD co-activation pattern of the frame. This step generated a time sequence of characteristic RSFC patterns for each rsfMRI run. Temporal transitions between every pair of RSFC patterns were then counted, which created a RSFC pattern transition matrix. A weighted directed transition network was constructed by thresholding this transition matrix, and was analyzed using graph theory. The same approach was also applied to human rsfMRI data to examine the translational value of the findings in rats. A schematic illustration of these procedures is shown in Figure 1. Schematic illustration of the data analysis pipeline. An example of a characteristic RSFC pattern is shown in Figure 2, and the other 39 characteristic RSFC patterns are shown in Figure 2—figure supplements 1–5. 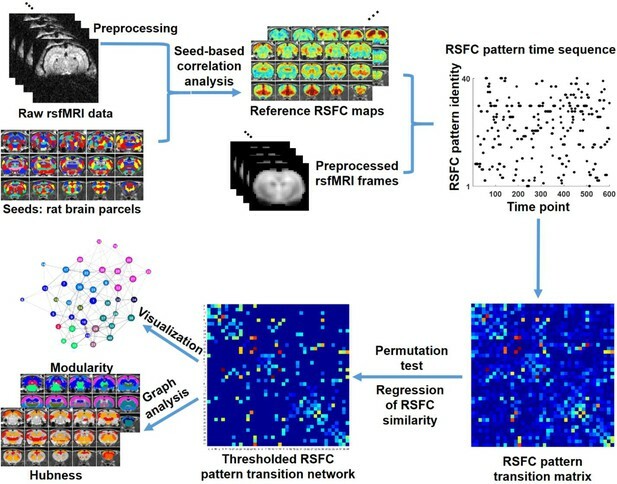 As the whole-brain parcellation scheme we adopted maximized within-parcel and minimized cross-parcel RSFC profile similarity, these 40 group-level seed-based RSFC maps represented a set of characteristic RSFC patterns in the awake rat brain, and were used as the reference patterns. Notably, the number 40 was arbitrarily selected as an example of low-dimensionality parcellation of the rat brain. Similar analysis can be applied using other parcel numbers. An example of a RSFC spatial pattern. Left: seed region; Mid: RSFC pattern of the seed. Color bar indicates t values; Right: average of rsfMRI frames matched to the RSFC pattern. Color bar shows BOLD amplitude. Distance to bregma is listed at the bottom of each slice. CC: spatial correlation coefficient between the average of rsfMRI frames (Right) and the corresponding seed map (Mid). Figure 2 (right panel) also shows the averaged pattern of rsfMRI frames that were matched to the reference RSFC pattern, which demonstrated high reminiscence between the BOLD co-activation pattern of single rsfMRI frames and the RSFC pattern it corresponded to (correlation coefficient = 0.91). We first demonstrated that temporal transitions between RSFC patterns were highly reproducible at the group level. We randomly split all rats into two subgroups and obtained the transition matrix for each subgroup. Both matrices exhibited high similarity (Figure 3a), reflected by a significant correlation (r = 0.86, p ≈ 0) between the corresponding off-diagonal entries. To control for the possible bias that transitions between similar RSFC patterns may have a higher chance to occur in both subgroups, which can inflate the reproducibility, we regressed out the spatial similarities between reference RSFC patterns from both transition matrices. The reproducibility remained high after regression, with a significant correlation value of 0.77 (p ≈ 0, Figure 3b). Taken together, these results suggest that transitions between RSFC patterns are not random but follow specific temporal sequences in awake rats, and these transition sequences are not dictated by the similarity between RSFC patterns. Reproducibility of the RSFC pattern transitions. (a) RSFC pattern transition matrices of subgroups 1 and 2 without regression of spatial similarities between reference RSFC patterns. (b) RSFC pattern transition matrices of subgroups 1 and 2 with regression of spatial similarities between reference RSFC patterns. Entries in each transition matrix were normalized to the range of [0, 1]. 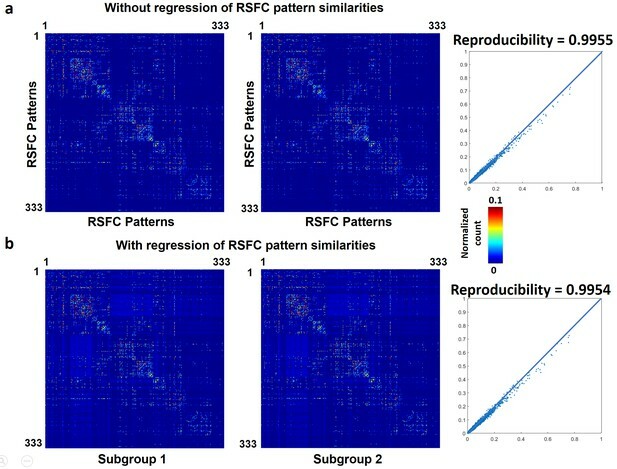 To further examine whether reproducible RSFC pattern transitions were dominated by a small portion of rats, we assessed the reproducibility of RSFC pattern transitions for each individual animal by computing Pearson correlation between each individual-level transition matrix and the group-level transition matrix. Fisher Z-transformed correlation values were then averaged across rats. Our data showed a significant individual-level reproducibility (mean (±SD)=0.57 (±0.14), p ≈ 0). These results collectively indicate that nonrandom RSFC pattern transitions are a characteristic feature in awake rats. To rule out the possibility that RSFC pattern transitions were caused by head motion (Laumann et al., 2016), we conducted several additional analyses. First, we re-evaluated the reproducibility of RSFC transitions between two subgroups of rats with relatively high and low motion, respectively. Rats in the first subgroup all had the motion level below the median, quantified by framewise displacement (FD). Rats in the second subgroup all had the motion level above the median. The mean (±SD) FD of the below- and above-median subgroups were 0.037 (±0.024) mm and 0.054 (±0.033) mm, respectively. Transition matrices were obtained in these two subgroups, respectively. Comparing these two transition matrices yielded a reproducibility of 0.786 with regression of RSFC pattern similarities, and 0.872 without regression of RSFC pattern similarities (Figure 3—figure supplement 1), which is similar to the reproducibility assessed based on a random division to subgroups (0.77 and 0.86 with and without regression of RSFC pattern similarities, respectively, Figure 3). In addition, the transition matrices from both subgroups were highly consistent with those in subgroups randomly divided (Figure 3). To statistically test whether the reproducibility using motion-based division to subgroups was different from that based on random divisions, we repeated random subgroup divisions 10000 times. Mean reproducibility (±SD) across all 10000 trials was 0.876 (±0.010) and 0.791 (±0.017) without and with regression of RSFC pattern similarities, respectively. Figure 3—figure supplement 2 shows the distributions of the reproducibility between randomly divided subgroups across all trials. This data demonstrated that the reproducibility using motion-based division to subgroups was not statistically different from the reproducibility based on random division regardless whether RSFC pattern similarities were regressed out (p=0.75) or not (p=0.67). These results indicate that high reproducibility in RSFC pattern transitions was not attributed to head motion. In the second analysis, we directly compared the motion level between rsfMRI frames involved in RSFC pattern transitions versus those that were not in transitions. All rsfMRI frames analyzed were categorized into two groups. The first group included frames whose preceding and/or successive frame corresponded to a different RSFC pattern (i.e. in transitions). The second group included frames whose preceding and successive frames were the same RSFC pattern (i.e. not in transition). These two groups of rsfMRI frames showed consistent motion levels, quantified by their FD values (p=0.44, two-sample t-test), again indicating that RSFC pattern transitions were not triggered by head motion. To further test whether some RSFC pattern transitions were induced by head motion, we measured the head motion during each transition and compared the mean head motion level for each transition sequence and the occurrence count of this transition sequence. Specifically, we calculated the mean FD for transitions between every two RSFC patterns. This calculation yielded a 40 × 40 matrix, in which each element quantified the mean FD for each transition sequence (e.g. element (i,j) of this matrix measured the mean FD for the transition from RSFC pattern i to RSFC pattern j). Our data showed that the correlation between this transition FD matrix and the RSFC pattern transition matrix was minimal (r = −0.034), suggesting that the mean head motion level during each transition sequence did not predict the occurrence count of this transition sequence. This result further supported that RSFC pattern transitions were independent of head motion, and RSFC transitions did not follow head motion. To examine whether our results were dependent on the motion censoring threshold selected (FD <0.2 mm), we reanalyzed our data using a more stringent censoring threshold (FC <0.1 mm). At this threshold and also keeping all other motion control criteria identical, very similar RSFC pattern transition matrices were obtained (Figure 3—figure supplement 3). The correlations between the RSFC pattern transition matrices at FD <0.1 mm and those at FD <0.2 mm were 0.83 and 0.88 with and without regression of RSFC pattern similarities, respectively, suggesting that our results were robust and insensitive to the motion censoring threshold applied. Figure 4 shows the group-level transition matrix thresholded using a permutation test (p<0.05, FDR corrected). Rows/columns in the transition matrix were arranged based on the brain system that the seed region of the reference RSFC pattern belonged to. Transitions between RSFC patterns tended to occur within the same brain system, as shown by a relatively denser distribution of near-diagonal nonzero elements in the matrix. However, cross-system transitions such as striatal-thalamic, striatal-somatosensory, striatal-prefrontal, striatal-hippocampal, hippocampal-amygdala, amygdala-motor transitions were observed. Thresholded group-level RSFC pattern transition matrix after regression of RSFC pattern similarities. Rows/columns are arranged based on the brain system of the seed regions. Numbers next to/below rows/columns correspond to the seed map number in Figure 2 and Figure 2—figure supplement 1. A directed weighted graph of the RSFC pattern transition network was constructed based on the group-level thresholded transition matrix (Figure 4), as shown in Figure 5. The number of edges was 242, yielding a connection density of 15.5%. The transition network exhibited a prominent community structure with nine modules identified using the Louvain community detection algorithm (Vincent et al., 2008), suggesting that RSFC patterns belonging to the same modules had a higher probability to transit between each other than RSFC patterns across modules. The corresponding seed regions of RSFC patterns were color coded based on the community affiliations (Figure 5 inlet). Module one primarily covered hippocampal and retrohippocampal networks as well as caudal visual networks. Module two included caudal midbrain networks. Module three was comprised of brainstem and rostral midbrain networks. Module four covered rostral visual, amygdala, hypothalamic as well as motor and olfactory networks. Module five was dominated by auditory and somatosensory networks. Module six captured posterior ventral thalamic networks. Module seven included anterior thalamic networks. Module eight covered striatal and prefrontal networks. Module nine mainly included anterior cingulate cortex network. 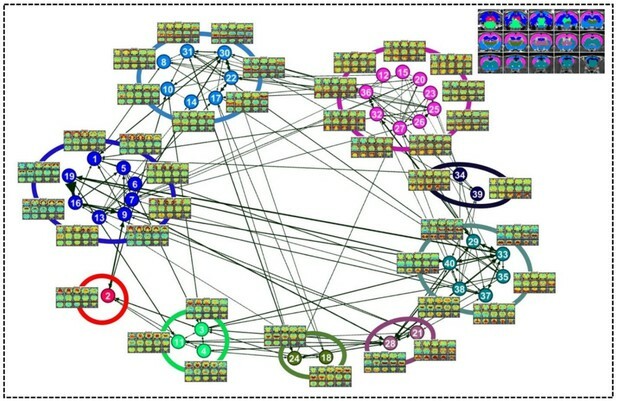 Networks from the same system usually fell into the same community, again indicating transitions between RSFC patterns frequently occurred within the same brain system. However, networks from different systems were also observed in the same modules, which highlights the importance of cross-system transitions. Community structures of the RSFC pattern transition network. The thresholded transition matrix in Figure 4 was used as the adjacency matrix to generate a directed weighted graph. The layout of nodes was based on a force-field algorithm (Jacomy et al., 2014). The node number corresponds to the seed map number in Figure 2 and Figure 2—figure supplement 1—5. Inlet: seed regions of RSFC patterns colored coded based on the community affiliations of nodes (i.e. RSFC patterns). By quantifying the node-specific graph measures of node strength, betweenness centrality, characteristic path length and local clustering coefficient, hub nodes (i.e. pivotal RSFC patterns) in the graph were identified. 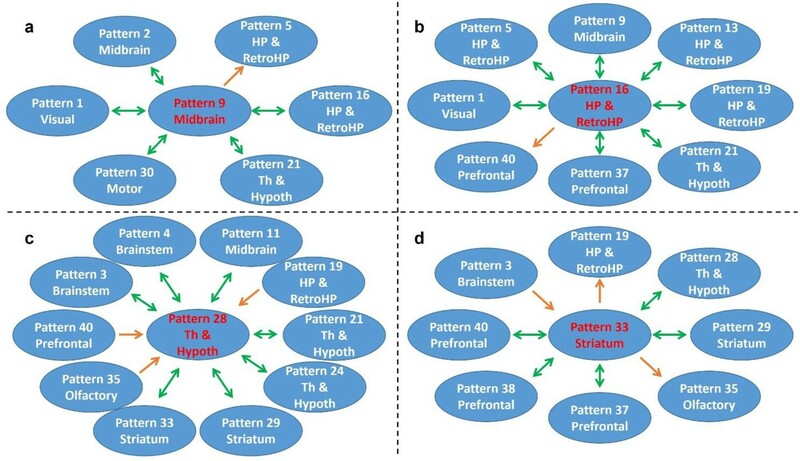 Six RSFC patterns were identified as hubs in rats (hub score ≥3) including the networks of retrosplenial cortex, dorsal superior and inferior colliculi, hippocampus, anterior ventral thalamus, striatum and motor cortex. Figure 6 shows the seed regions of RSFC patterns with hub score ≥1, color coded based on the hub score. No color was given to seed regions of RSFC patterns with hub score = 0. Top: Seed regions of RSFC patterns with hub score ≥1, color coded based on the hub score. No color was given to seed regions of RSFC patterns with hub score = 0. Bottom: the brain systems of seed regions. Figure 7 shows RSFC pattern transitions of four representative hubs (red nodes), demonstrating the pivotal role of these patterns in RSFC temporal transitions. The majority of transitions between hubs and other RSFC patterns were bidirectional. Figure 7a shows transitions of the hub network of the superior and inferior colliculi with the networks of the periaqueductal gray, hippocampus, dorsal thalamus, hypothalamus, caudal visual cortex and motor areas. Figure 7b demonstrates the transitions between the hippocampus network (hub) and the RSFC networks of the superior and inferior colliculi, hippocampus/retrohippocampus, caudal visual cortex, as well as prefrontal and orbital cortices. Figure 7c displays transitions between the hub network of the anterior ventral thalamus and the RSFC networks of the brainstem, midbrain, dorsal CA1, dorsal thalamus, posterior ventral thalamus, dorsal caudate-putamen (CPu), olfactory tubercle, and orbital cortex. Figure 7d illustrates the transitions between the hub network of the ventral CPu, and the RSFC networks of the brainstem and olfactory tubercle, as well as infralimbic, prelimbic, and orbital cortices. Taken together, these results indicate that hub RSFC patterns were centralized patterns that play a pivotal role in transitions with other RSFC patterns involving multiple brain systems. Transition patterns of hub networks. Green arrows denote bidirectional transitions between RSFC patterns. Orange arrows denote unidirectional transitions between RSFC patterns. Pattern numbers correspond to the seed map numbers shown in Figure 2 and Figure 2—figure supplement 1—5. The brain system of the seed for each pattern is listed in the circle. Th and Hypoth, Thalamus and Hypothalamus; HP and RetroHP, Hippocampus and Retrohippocampus. To assess whether temporal transitions between RSFC patterns were also nonrandom in humans, we applied the same analysis to rsfMRI data from 812 human subjects in the HCP. Each frame was matched to one of 333 characteristic RSFC patterns defined by a well-established RSFC-based parcellation in humans (Gordon et al., 2016), and the number of transitions between every two RSFC patterns was counted for each subject. All subjects were then randomly split into two subgroups (406 subjects in each subgroup). The reproducibility between two subgroups was 0.9955 (without regression of seed map similarities, Figure 8a), and 0.9954 (with the regression of seed map similarities, Figure 8b). To assess the reproducibility at the individual level, the correlation between the transition matrix of each individual subject versus the group-level transition matrix was calculated. The mean correlation (±SD) across all subjects was 0.60 (±0.05). All these results were highly consistent with our findings in awake rats, suggesting that nonrandom transitions between RSFC patterns are conserved across species and might represent a characteristic feature of the mammalian brain. Reproducibility of temporal transitions between 333 characteristic RSFC patterns in humans. The transition matrices of two randomly divided subgroups (a) without regression of RSFC pattern similarities (b) with the regression of RSFC pattern similarities. The group-level transition matrix obtained from all 812 human subjects was thresholded using the same permutation test (p<0.05, FDR corrected), as shown in Figure 9. Rows/columns of the RSFC transition matrix were grouped based on the brain system of the seed region. Similar to RSFC pattern transitions in rats, transitions between RSFC patterns in humans tended to occur within the same brain system, indicated by a denser distribution of near-diagonal nonzero elements in the matrix. However, considerable across-system RSFC pattern transitions were also evident. Thresholded group-level RSFC pattern transition matrix in humans (permutation test, p<0.05, FDR corrected). Rows/columns are grouped based on the brain system of the seed. The hub score of each RSFC pattern was calculated in the same way as the rat data. Figure 10 showed seed regions of RSFC patterns with hub score ≥1, color coded based on the hub score. Seed regions of RSFC patterns with hub score = 0 were not given any color. Our results demonstrated that the human RSFC pattern transitions contain multiple hubs (hub score ≥3) in separate brain systems including default-mode (five nodes), cingulo-opercular (eight nodes), dorsal attention (two nodes), ventral attention (four nodes), fronto-parietal (four nodes), parietal memory (one node) and visual (five nodes) networks. Interestingly, these hub patterns were predominantly integrative networks. Hub scores of RSFC patterns in humans displayed on their seed regions. The boundary of nodes was color coded based on the brain system (right). Nodes with hub score ≥3 were defined as hubs (yellow-filled nodes). In the present study, we investigated temporal sequential transitions between intrinsic brain activity patterns in the awake rat and human brain. We showed that transitions between RSFC patterns exhibited high reproducibility across animals and were significantly above chance (Figures 3 and 4). In addition, the RSFC pattern transition network was constructed using the thresholded transition matrix (Figure 4), and its topological organization including the community structure (Figure 5) and hubness (Figure 6) was evaluated. Moreover, the transitions of four representative hub RSFC patterns in rats were demonstrated (Figure 7). Importantly, non-random RSFC pattern transitions were also observed in humans (Figure 8), and the organization of the human transition network was further analyzed using the same graph analysis approach (Figures 9 and 10). Taken together, the present study for the first time characterized the temporal organization between successive brain connectivity configurations. It demonstrates that spontaneous brain activity was not only far from random spatially, but also far from random temporally. Similar results in rats and humans indicate that this feature might be well conserved across species. These data collectively have provided new insight into understanding the spatiotemporal dynamics of spontaneous activity in the mammalian brain. Although it has been well recognized that RSFC is dynamic in nature (Hutchison et al., 2013a), previous studies in this research line generally focused on revealing the spatial features of recurring RSFC patterns. Meanwhile, we have relatively sparse knowledge in the temporal relationship between characteristic RSFC patterns (Majeed et al., 2011; Zalesky et al., 2014; Vidaurre et al., 2017). To bridge this gap, we set out to systematically investigate temporal transitions between RSFC patterns. To tackle this issue, we first need a set of representative RSFC patterns in the awake rat brain. Since the rat brain has ~6000 brain voxels at our spatial resolution (0.5 × 0.5 × 1 mm3), in principle we can have ~6000 RSFC profiles in total. However, elucidating temporal sequences between such a large number of RSFC patterns is not only computationally intensive, but also unnecessary as many of these patterns are highly similar to each other. To obtain a survey of characteristic RSFC patterns, we adopted a RSFC-based parcellation of the awake rat brain (Ma et al., 2016). In this scheme, all ~6000 voxels were clustered into 40 parcels based on the similarity of their RSFC patterns, so that brain voxels’ RSFC profiles were similar within each parcel but dissimilar across parcels (Ma et al., 2016). Notably, these parcels were highly reproducible between animals and exhibited high with-parcel homogeneity (Ma et al., 2016). Therefore, RSFC patterns obtained based on these parcels provided a comprehensive representation of all ~6000 RSFC patterns. To examine the temporal relationship between these characteristic RSFC patterns, we adapted a recently developed method showing that BOLD co-activation patterns of rsfMRI frames well correspond to their instantaneous RSFC patterns (Liu et al., 2013; Liu and Duyn, 2013). This notion has been demonstrated in both humans, as well as in awake and anesthetized rats (Liang et al., 2015). Using this notion, each rsfMRI frame was corresponded to one of the 40 characteristic RSFC patterns based on the spatial similarity to the frame’s BOLD co-activation pattern. The validity of this matching process was confirmed by high spatial similarity between averaged rsfMRI frames and matched characteristic RSFC patterns, quantified by their spatial correlations (Figure 2 and Figure 2—figure supplements 1–5). This step resulted in a time sequence of RSFC patterns, which allowed us to systematically investigate the temporal transitions between these RSFC patterns. Our data showed that temporal transitions between RSFC patterns were highly reproducible in rats, reflected by significant reproducibility between randomly divided subgroups. In addition, these reproducible transitions were not dominated by a small portion of animals, evidenced by highly significant reproducibility at the individual level. To rule out the possible inflation of reproducibility resulting from the possibility that transitions between more similar RSFC patterns may occur at a higher chance in both subgroups, spatial similarities between characteristic RSFC patterns were regressed out in the transition matrices of both subgroups, and we found that the reproducibility of transitions remained high. These data show that transitions between RSFC patterns were robust and not dictated by RSFC pattern similarities. In addition, using permutation tests, we identified a number of transitions between RSFC patterns that were statistically above chance, further demonstrating that these transitions were non-random. We also ruled out the possibility that RSFC pattern transitions were driven by head motion. Consistent transition matrices were obtained in two subgroups of animals with low (below median) and high (above median) motion levels (Figure 3—figure supplement 1). Using a permutation test, we confirmed that the reproducibility using motion-based division to subgroups was statistically not different from the reproducibility based on random division with (p=0.75) and without (p=0.67) regression of RSFC pattern similarities (Figure 3—figure supplement 2). In addition, no difference in head motion was observed between rsfMRI frames involved and not involved in a transition. We also found a minimal correlation between the mean head motion level for each transition sequence and the occurrence count of this transition sequence (r = −0.034), further indicating that RSFC pattern transitions were independent of head motion. Finally, consistent results were obtained at a more stringent motion censoring threshold (Figure 3—figure supplement 3), which demonstrated that our results were robust and insensitive to the motion censoring threshold selected. Taken together, these data provide strong evidence indicating that RSFC patterns do not transit from/to each other in a random manner, but follow specific temporal sequences. This result well agrees with a recent report that spontaneous activity from ensembles of simultaneously recorded neurons was characterized by ongoing spatiotemporal activity patterns (Mazzucato et al., 2015), which recurred during all trials, and transitions between patterns could be reliably extracted using a hidden Markov model (Mazzucato et al., 2015). We found that transitions between RSFC patterns occurred frequently between networks from the same brain system (Figure 4). This result might be attributed to the factor that seed regions of networks in the same brain system typically subserve similar brain function. 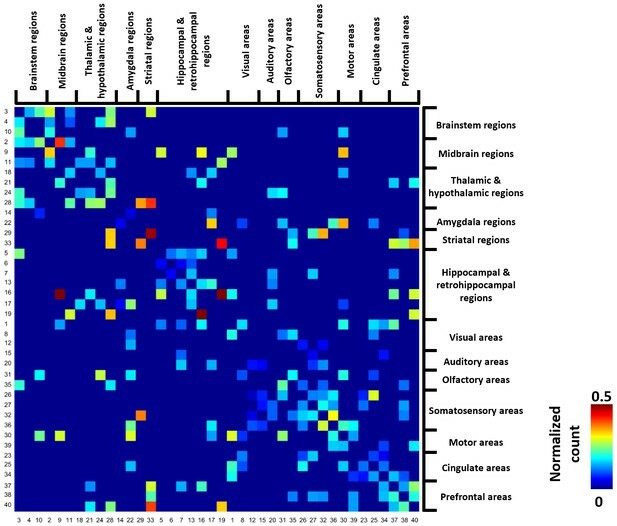 In addition, regions in the same brain system are usually strongly connected with each other (Liang et al., 2013), and thus transitions between their RSFC patterns can frequently occur. Our data also showed prominent cross-system transitions (Figure 4). For instance, switching between striatal networks and somatosensory/prefrontal cortical networks frequently occurred. Such cortical-subcortical system transitions might rely on the structural basis of corticostriatal projections identified in the rat brain (Paxinos, 2015). We speculate that bidirectional transitions between striatal and somatosensory/prefrontal RSFC networks might indicate the presence of both ‘bottom-up’ and ‘top-down’ processing involving high-order cortical and low-order subcortical regions at rest (Gurney et al., 2015; Piray et al., 2016). In addition, significant transitions from striatal to thalamic/hippocampal RSFC networks indicate a close relationship between these subcortical systems, which can be further supported by strong RSFC between the CPu and thalamus found in the awake rat brain (Liang et al., 2013). Taken together, these results show non-trivial transitions between RSFC patterns within and across systems in the awake rat brain, and such transitions might play a critical role in coordinating spontaneous brain activity in separating brain systems. A graph characterizing the transition network between RSFC patterns was constructed with each node representing a characteristic RSFC pattern and each edge denoting a statistically significant transition relationship between two nodes. We investigated the topological organization of this weighted directed graph including its community structure (Figure 5) and hubness (Figure 6). The transition network exhibited a prominent community structure evidenced by a high modularity, indicating that the global transition network between RSFC patterns was organized in a non-trivial manner. We also identified several hub RSFC patterns (Figure 6) and scrutinized their transitions with other RSFC patterns (Figure 7). Hub patterns were central nodes in the RSFC transition network which played a pivotal role in transitions from/to other RSFC patterns. We found that the hippocampus RSFC network was pivotal to the transitions to the superior and inferior colliculi networks, as well as visual, prefrontal and orbital cortical networks. A recent study showed that low-frequency hippocampal–cortical activity drove brain-wide rsfMRI connectivity, highlighting the pivotal role of the hippocampus in RSFC transitions (Chan et al., 2017). In addition, Xiao and colleagues demonstrated that hippocampal spikes were associated with calcium cortical co-activation patterns in the visual and cingulate cortical regions (Xiao et al., 2017), consistent with our observation of transitions between hippocampal networks and visual/cingulate networks (Figure 7). Interestingly, it has also been reported that the hippocampus interacted with multiple cortical and subcortical regions in the form of sharp wave ripples (Logothetis et al., 2012), and the onset of such ripples was found to be controlled by the propagating signals from the cortex to hippocampus (Mölle et al., 2006; Hahn et al., 2012; Roumis and Frank, 2015). These results agree with the bidirectional transitions between hippocampal and cortical networks found in the present study (Figure 7). Although sharp wave ripples in the hippocampus and RSFC pattern transitions might be from different signal sources, the centralized role of the hippocampus is shared by these two forms of hippocampal-cortical information flow. In accordance with our previous report that anterior ventral thalamus was a critical hub in the rat functional brain network (Ma et al., 2016), the RSFC pattern of anterior ventral thalamus was also a hub in the network of RSFC pattern transitions. A recent study investigating the relationship between single neuron spiking activity and brain-wide cortical calcium dynamics found that thalamic spikes could both predict and report (i.e. firing before and after) various types of large-scale cortical activity patterns, which were supported by slow calcium activities (<1 Hz) (Xiao et al., 2017). These data indicate a pivotal role of the thalamus in transitions between distinct spontaneous brain activity patterns. This result can be further supported by the finding that the ventral thalamus could recruit long-range cortical and subcortical networks and initiate their interactions through low-frequency (1 Hz) activity (Leong et al., 2016), and the thalamus could facilitate diverse and brain-wide functional neural integration in a specific spatiotemporal manner (Liu et al., 2015; Leong et al., 2016). Further, our data revealed a hub of the RSFC pattern of the ventral CPu. As a part of the striatum, CPu is linked to multiple corticostriatal projections (Paxinos, 2015), and it might play a centralized role in transitions involving multiple cortical RSFC patterns (Lee et al., 2017). Taken together, these data indicate that hub RSFC patterns were central nodes linking multiple brain systems and might be critical for us to understand how activities from different brain systems are integrated to maintain normal brain function in rodents. To examine whether nonrandom RSFC pattern transitions we observed were only a specific feature in the rat brain, we investigated RSFC pattern transitions in humans by applying the same analysis approach to rsfMRI data from the HCP. We found that, like rats, transitions between RSFC patterns were also nonrandom in humans, evidenced by highly consistent transition matrices between two randomly divided subject subgroups. This result well agrees with a recent study showing that dynamic switching between human brain networks was not random (Vidaurre et al., 2017). Interestingly, the split-group reproducibility was somewhat higher in humans than those observed in rats (both with and without regression of RSFC pattern similarities). This difference is likely due to much more human data used (406/406 human subjects v.s. 20/21 rats in each subgroup), which would average out larger amount of individual variability. This concept can be further supported by comparable reproducibility rates if we randomly picked 20 human subjects for each subgroup (reproducibility = 0.91 for human data v.s. reproducibility = 0.86 for rat data), as well as similar reproducibility at the individual level (human data: 0.6(±0.05); rat data: 0.57 (±0.14)). Collectively, these results suggest that nonrandom transitions between characteristic RSFC patterns are not merely a specific feature in rodents, but conserved in both humans and rats. The group-level RSFC pattern transition matrix was also thresholded using the permutation test. We found that, consistent with rat data, RSFC pattern transitions in humans more frequently occurred within the same brain system, but considerable cross-system transitions were also observed. We further calculated the hubness of individual nodes in the human RSFC transition network, and found multiple hubs belonging to separate brain systems including default-mode, cingulo-opercular, dorsal attention, ventral attention, fronto-parietal, parietal memory and visual networks. Intriguingly, virtually all hubs were integrative networks (with the only exception of the visual network) that are known to integrate information from multiple areas (e.g. sensori-motor systems). Our data suggest that these integrative networks are central in human RSFC pattern transitions. 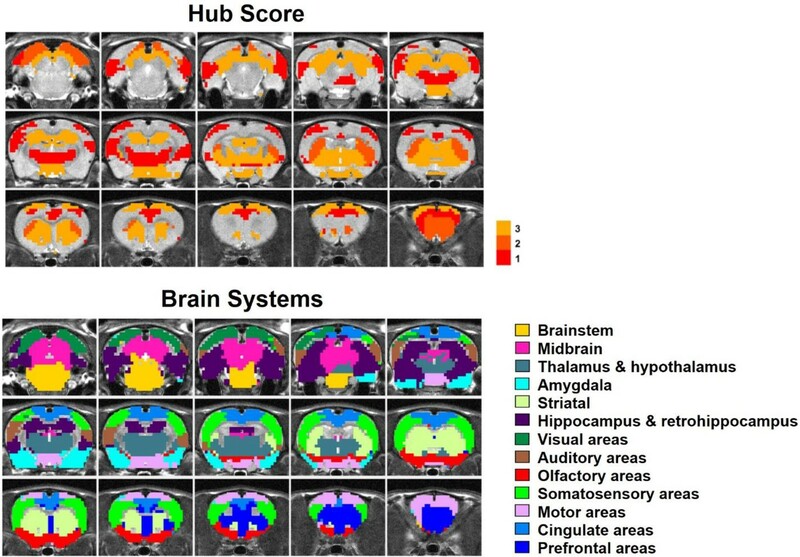 It has to be noted that direct comparisons of hubs between human and rat data is still premature as the human brain parcellation in Gordon et al.’s scheme did not include subcortical regions, while most transition hubs in the rat brain were subcortical networks. Such comparison is warranted in more detailed studies in the future. Nonetheless, these findings still highlight the translational utility of the analysis applied in the present study, which might shed light onto comparative neuroanatomy. Our results have also provided new insight into understanding the spatiotemporal dynamics of spontaneous activity in the mammalian brain. One limitation of the present study is that single rsfMRI frames could exhibit features of more than one RSFC pattern. It should be noted that corresponding a rsfMRI frame to its most similar reference RSFC pattern is only an approximation for the purpose of investigating spatiotemporal dynamics of spontaneous brain activity. To mitigate this issue, we set a minimal threshold (correlation coefficient >0.1, p<10−13) to remove rsfMRI frames that were not similar to any of 40 reference RSFC patterns (e.g. rsfMRI frames dominated by noise), and ensured that the similarity between each rsfMRI frame and the RSFC pattern it corresponded to was statistically significant after Bonferroni correction (p<0.05/40834 rsfMRI volumes ≈ 10−6). 89.9% of total rsfMRI volumes met this criterion, indicating that reference RSFC patterns indeed captured most spontaneous brain activity patterns in the awake rat brain. In conclusion, the present study investigated temporal transitions between spontaneous brain activity patterns in the awake rat and human brain. We found that these transitions were far from random in both species, demonstrating that this feature might be a general phenomenon in the mammalian brain. Using graph theory analysis, our study further revealed central RSFC patterns in the transition networks. This study has opened a new avenue to investigating the spatiotemporal organization of spontaneous activity in the mammalian brain. 41 Long-Evans (LE) adult male rats were used. Data from 31 rats were also used in another study (Ma et al., 2016) and were reanalyzed for the purpose of the present study. All rats were housed in Plexiglas cages with controlled ambient temperature (22–24°C) and maintained on a 12 hr light:12 hr dark schedule. Food and water were provided ad libitum. The experiment was approved by the Institutional Animal Care and Use Committee (IACUC) at the Pennsylvania State University. Rats were acclimated to the MRI environment for seven days following the procedures described in (Zhang et al., 2010; Liang et al., 2011, 2012a, 2012b, 2014; Gao et al., 2017) to minimize motion and stress. For the setup of awake animal imaging, the rat was first briefly anesthetized with 2–3% isoflurane and fit into a head holder with a built-in coil and a body tube. Isoflurane was then discontinued and the rat was placed into the magnet. All rats were fully awake during imaging. We measured the respiratory rate in a separate cohort of animals (n = 16) that were imaged using the same setting. The mean (±SD) breathing rate = 86.2 (±15.5), which was well within the normal range of breathing rate in rats (70–100 Hz). This measurement was also consistent with the normal physiological state measured in rats acclimated to MRI environment using similar methods in other labs (King et al., 2005; Ferenczi et al., 2016), suggesting that animals were well adapted to the MRI environment during imaging. A similar approach has also been used for awake rodent fMRI in other groups (Bergmann et al., 2016; Chang et al., 2016b; Yoshida et al., 2016). MRI data acquisition was conducted on a Bruker 7T small animal MRI scanner (Billerica, MA). Anatomical MRI images were acquired using a T1-weighted rapid imaging with refocused echoes (RARE) sequence with the following parameters: repetition time (TR) = 1500 ms; echo time (TE) = 8 ms; matrix size = 256 × 256; field of view (FOV) = 3.2 × 3.2 cm2; slice number = 20; slice thickness = 1 mm; RARE factor = 8. rsfMRI images were acquired using a T2*-weighted gradient-echo echo planar imaging (EPI) sequence with the following parameters: TR = 1000 ms; TE = 15 ms; matrix size = 64 × 64; FOV = 3.2 × 3.2 cm2; slice number = 20; slice thickness = 1 mm. 600 EPI volumes were acquired for each run, and two to four runs were acquired for each animal. Detailed description of the image preprocessing pipeline can be found in (Ma et al., 2016) and is briefly summarized as follows. Relative FD (Power et al., 2012) of rat brain EPI images was calculated, and EPI volumes with FD >0.2 mm and their immediate temporal neighbors were removed (1.75% of total rsfMRI volumes). The first 10 volumes of each rsfMRI run were also removed to warrant a steady state of magnetization. Brain normalization to a standard rat brain was performed using Medical Image Visualization and Analysis (MIVA, http://ccni.wpi.edu/). Head motion was corrected using SPM12 (http://www.fil.ion.ucl.ac.uk/spm/). In-plane spatial smoothing was carried out using a Gaussian filter (FWHM = 0.75 mm). Nuisance regression was performed with the regressors of three translation and three rotation motion parameters estimated by SPM as well as white matter and ventricle signals. Band-pass filtering was performed with the frequency band of 0.01–0.1 Hz. To obtain a library of characteristic RSFC spatial patterns in the awake rat brain, we used a RSFC-based whole-brain parcellation scheme (40 non-overlap parcels) we previously published (Ma et al., 2016). In this scheme, voxels with similar RSFC patterns were grouped together, so that RSFC patterns were similar within parcels but dissimilar across parcels (Ma et al., 2016). As a result, these 40 RSFC patterns represented a set of characteristic RSFC patterns in the awake rat brain and were used as the references (also see Supplemental Information). All characteristic RSFC patterns were obtained using seed-based correlational analysis with each parcel as the seed. Specifically, the regionally-averaged time course from all voxels within the seed region was used as the seed time course, and the Pearson cross-correlation coefficient between the seed time course and the time course of each individual brain voxel was calculated. Correlation analysis was performed for the first 540 volumes of each rsfMRI run to ensure the same degree of freedom. Correlation coefficients were then Fisher's Z-transformed. For each parcel, its group-level RSFC map was voxelwise calculated using one-sample t-test based on a linear mixed-effect model with the random effect of rats and the fixed effect of Z values for each run. The spatial similarity between these reference RSFC patterns was determined by pairwise spatial correlations between every two characteristic RSFC patterns. To analyze temporal transitions between RSFC patterns, a time sequence of framewise RSFC patterns (1 s each frame) was first obtained by matching each rsfMRI frame to one of the 40 reference RSFC patterns, based on the notion that BOLD co-activation patterns in single rsfMRI frames also represent their RSFC patterns (Liu et al., 2013; Liu and Duyn, 2013; Liang et al., 2015). To do so, preprocessed rsfMRI time series were first demeaned and variance normalized. Subsequently, the spatial Pearson correlation coefficients between each rsfMRI frame and individual reference RSFC patterns in the library were respectively calculated. The reference RSFC pattern that best matched the rsfMRI frame (i.e. the reference RSFC pattern that had the highest spatial correlation) was selected. To ensure the correspondence between each rsfMRI frame and the matched RSFC pattern was statistically meaningful, we set a minimal threshold of the spatial correlation coefficient >0.1 (p value < 10−13). 89.9% of total volumes met this criterion. Frames that did not meet this criterion (10.09% of total volumes) were labeled as not corresponding to any reference RSFC patterns. This step generated a time sequence of framewise RSFC patterns. In this sequence, each rsfMRI frame was denoted by a number between 1 and 40, representing its correspondence to one of the 40 reference RSFC patterns. The number 0 was used to denote rsfMRI frames not corresponding to any reference RSFC patterns, as well as frames removed in image preprocessing (e.g. frames with large FD). In the sequence, the number of transitions between every two RSFC patterns was counted (i - > j, where i ≠ j, i ≠ 0 and j ≠ 0). Transitions involving 0 (i.e., 0 - > 0, or 0 - > i, or i - > 0, where i ≠ 0) were not counted. This procedure yielded a 40 × 40 RSFC pattern transition matrix, where its entry (i, j) represented the number of transitions between RSFC pattern i to pattern j. The reproducibility of temporal transitions between RSFC patterns was assessed at both the group and individual levels. At the group level, we used a split-group approach. All 41 rats were randomly divided into two subgroups with 20 rats in subgroup 1 and 21 rats in subgroup 2. The RSFC pattern transition matrix was computed for each subgroup. Entries in each matrix were normalized to the range of [0, 1], and the correlation of the corresponding off-diagonal matrix entries between the two subgroups was assessed. It is possible that spatially similar RSFC patterns had a higher chance to transit between each other in both subgroups, and this systematic bias might inflate the reproducibility of RSFC pattern transitions between the two subgroups. To control for this effect, we regressed out the spatial similarity between every two reference RSFC patterns, quantified by their spatial correlation value, from the transition matrices in both subgroups and then assessed the reproducibility again. Reproducibility of temporal transitions between RSFC patterns was also evaluated at the individual level. For each rat, its individual-level transition matrix was obtained, and the reproducibility was computed using Pearson correlation of the corresponding off-diagonal matrix entries between this individual-level transition matrix and the group-level transition matrix. The group-level transition matrix was thresholded to identify transitions that were statistically significant. The p value of each entry in the transition matrix was calculated using the permutation test. Since we were only interested in transitions between two different RSFC patterns, before the permutation test, the temporal sequence of RSFC patterns was consolidated by combining consecutively repeated appearances of the same pattern to one appearance of the pattern. For example, four consecutive appearances of Pattern ‘x’ (i.e. ‘xxxx’) were replaced by one ‘x’. This consolidated temporal sequence was then permuted 10000 times, and a transition matrix was obtained for each permuted sequence. This step generated an empirical null distribution for each off-diagonal entry in the transition matrix, and the p value of the entry was obtained accordingly. p values were further adjusted using false-discovery rate (FDR) correction at the rate of 0.05 (Genovese et al., 2002). Entries with insignificant p values were set to zero. All entries were then rescaled to the range of [0,1]. Finally, similarities between RSFC patterns were regressed out from nonzero entries. Using this thresholded transition matrix as the adjacency matrix, a graph was constructed using Gephi 0.9.1 (https://gephi.org/). In this weighted directed graph, each node represented a RSFC pattern, and each edge connecting two nodes signified an above-chance transition between two RSFC patterns with the edge weight proportional to the normalized number of transitions. Graph theory analysis of this RSFC pattern transition network was performed using the Brain Connectivity Toolbox (https://sites.google.com/site/bctnet/). The community affiliation of nodes in the graph was obtained by repeating the Louvain community detection algorithm (Vincent et al., 2008) for 1000 times to ensure a stable solution. Specifically, for each repetition, a 40 × 40 matrix was generated so that its entry (i, j) was one if nodes i and j were in the same community and 0 otherwise. The average of these 1000 matrices was then binarized using a threshold of 0.9, and the final inference of the community affiliation was obtained from the node affiliation of connected components in the binarized matrix (Liang et al., 2011). To identify the hub nodes in the transition graph, local graph measures of node strength, betweenness centrality, local characteristic path length and local clustering coefficient of each node were first computed. Using these node metrics, hub nodes with high node strength, high betweenness centrality, short distance to other nodes, and low local clustering coefficient (Bullmore and Sporns, 2009) were identified using the method described in (van den Heuvel et al., 2010). Briefly, a hub score (0 to 4) was given to each node according to the total number of the following criteria the node met: (1) upper 20 percentile in node strength; (2) upper 20 percentile in betweenness centrality; (3) lower 20 percentile in characteristic path length; and (4) lower 20 percentile in local clustering coefficient. Node met at least three criteria was defined as a hub (i.e. hub score ≥3), indicating its pivotal role in transitions between RSFC patterns. The reproducibility of temporal transitions between RSFC patterns in the human brain was evaluated using a similar process. The human data used were the ‘extensively preprocessed 3T rsfMRI data’ from 812 subjects, which were a subset of the S1200 Subjects Data Release of the Human Connectome Project (HCP, https://www.humanconnectome.org/) (Van Essen et al., 2013). All rsfMRI data were acquired on a 3T Siemens Skyra MRI scanner using a multi-band EPI sequence with the parameters of TR = 720 ms, TE = 33.1 ms, flip angle = 52°, FOV = 208 × 180 mm2, matrix size = 104 × 90, voxel size = 2 × 2×2 mm3, slice number = 72, slice thickness = 2 mm, multiband factor = 8 (Feinberg et al., 2010; Moeller et al., 2010; Setsompop et al., 2012; Glasser et al., 2013). Data preprocessing used the HCP minimal preprocessing pipelines (Glasser et al., 2013), MSM-All brain registration (Robinson et al., 2014). Head motion correction was conducted using the ICA + FIX pipeline (Griffanti et al., 2014; Salimi-Khorshidi et al., 2014), and these procedures were completed by the HCP. To obtain a library of characteristic RSFC patterns in the human brain, we used a well-established RSFC-based parcellation scheme (333 parcels) (Gordon et al., 2016), which has been demonstrated to have high within-parcel homogeneity and reflect the underlying connectivity structure of the human brain (Gordon et al., 2016). Based on this scheme, 333 characteristic RSFC patterns were obtained using seed-based correlational analysis with individual parcels as seeds. For each rsfMRI run, the seed time course was averaged from all grayordinates within the seed, and Pearson cross-correlation coefficient between the seed time course and the time course of each individual cortical grayordinate was calculated. Correlation coefficients were Fisher's Z-transformed. For each parcel, its group-level RSFC map was grayordinate-wise calculated by one-sample t-test using a linear mixed-effect model with the random effect of subjects and the fixed effect of Z values for individual runs. Pairwise spatial correlations between these group-level RSFC maps were also calculated to measure their similarities. Each rsfMRI frame was matched to one of the 333 reference patterns that had the highest spatial similarity to the BOLD co-activation pattern of the frame, gauged by their spatial Pearson correlation. The minimal spatial correlation coefficient was set at 0.05. rsfMRI frames below this threshold were labeled as not corresponding to any reference RSFC patterns. This step generated a temporal sequence of RSFC patterns for each rsfMRI run. In this sequence, each rsfMRI frame was denoted by a number between 1 and 333, representing its correspondence to one of the 333 characteristic RSFC patterns. The number 0 was used to denote rsfMRI frames not corresponding to any reference RSFC patterns. In the sequence, the number of transitions between every two RSFC patterns was counted (i - > j, where i ≠ j, i ≠ 0 and j ≠ 0). Transitions involving 0 (i.e., 0 - > 0, or 0 - > i, or i - > 0, where i ≠ 0) were not counted. This procedure yielded a 333 × 333 temporal transition matrix for each run. The temporal transition matrix for each subject was obtained by summing the temporal transition matrices from all four rsfMRI runs. The group-level transition matrix was obtained by averaging the subject-level temporal transition matrices across all subjects. The reproducibility of temporal transitions between RSFC patterns in the human brain was also assessed at both the individual and group levels. The individual-level reproducibility was calculated based on the correlation of off-diagonal entries between the individual’s transition matrix and the group-level transition matrix. The group-level reproducibility was evaluated using a split-group approach. All 812 subjects were randomly divided into two subgroups (406 subjects each subgroup). The RSFC pattern transition matrix was computed for each subgroup, respectively, and the correlation of off-diagonal matrix entries between the two subgroups were assessed. To control for the effect of the spatial similarity between characteristic RSFC patterns on the reproducibility measure, we also regressed out the spatial correlation values between characteristic RSFC patterns from the transition matrices in both subgroups and then re-assessed the reproducibility. All reproducibility assessment was based on unthresholded matrices. To construct the human RSFC pattern transition network, the group-level RSFC transition matrix obtained from all 812 subjects was thresholded using same permutation test as that used in rats, and the graph theory analysis was applied in a similar manner. Frontiers in Systems Neuroscience 5:2. Journal of Neuroscience Methods 148:154–160. Frontiers in Systems Neuroscience 7:101. Magnetic Resonance in Medicine 67:1210–1224. Frontiers in Human Neuroscience 6:339. Journal of Statistical Mechanics: Theory and Experiment 2008:P10008. Journal of Neuroscience Methods 274:38–48. Journal of Neuroscience Methods 189:186–196. The reviewers found the topic and phenomenon described very interesting and significant, but they raised several methodological concerns that would require considerable time to address. Also, the study is an extension of a prior study, and thus conceptually not sufficiently novel. We therefore believe it is better suited for a more specialized Journal. The discovery that the BOLD signal can be used to measure the resting state functional connectivity had a major impact on our understanding of brain functions and the development of the central nervous system. This non-invasive imaging approach allows the characterization of brain connectivity in humans and animal models. The signal is generally considered to be stationary, and provides insights into the temporal correlations of this so-called default state between different brain regions. Indeed, the assumption of a stationary nature is critical since any changes in these correlations are assumed to be due to differences in functional connectivity. The identification of temporal variability is therefore very significant. The present study provides evidence for a temporal variability. It is not the first study to do so, hence the study is not entirely novel, and the authors need to better emphasize what sets this study apart from other studies (including their own publication). 1) Given that a similar finding was already reported in an animal study, the addition of human MRI studies using the same approach would significantly enhance the impact of this study. To the best of my knowledge this has not been demonstrated in humans. 2) To what extent can the authors exclude movement artifacts. Given the important implications of these temporal shifts, it is important to exclude movements as a cause. Also can the authors identify any other reproducible reasons for the temporal variability? The manuscript by Ma et al. detailed the investigation of the transitions of rsfMRI functional connectivity (RSFC) network patterns in an awake rat. The authors' method of analysis that combines several recent approaches from prior publications – parcellation of RSFC patterns in an awake animal and utilizing graph theory approaches to identify) – is innovative. At present, the findings are novel and such analysis method could potentially be utilized to reveal similar dynamics in human rsfMRI studies. However, the manuscript can be significantly strengthened by further analyses of the current data and the discussions/interpretations improved by better integrating several pieces of prior literature that are presently omitted. I believe that English editing would also further improve this manuscript as there are grammatical errors and at places, the message is not completely clear. a) How long was each rsfMRI frame? I was unable to find the details in the Materials and methods section. b) How well does each rsfMRI frame correspond to one of the 40 characteristic RSFC patterns? It would be best if the authors show and compare the representative 40 RSFC patterns generated from rsfMRI frames and those that were generated from a rsfMRI run (as shown in Figure 2 and Figure 2—figure supplements 1-39). This is because the number of time points included within each rsfMRI run will affect the sensitivity in detecting RSFC patterns and likely influence the subsequent analysis. 2) It is difficult to understand and interpret Figure 5, I believe its quality can be significantly improved. The authors should improve the visualization of the transition network as depicted in Figure 5A and how that translates to Figure 5B. As eLife is a general life and biomedical sciences journal, it would be difficult for readers to grasp the concept of such a complex graph theoretical network analysis just by reading the details in the Materials and methods section. The figure here should be used to best portray a simplistic yet informative summary of the analysis technique and the scientific findings. 3) It is still unclear what is the biological significance in the detection of numerous types of transition RSFC patterns. The authors only describe the observation of such transitions but based on the present discussions, it is unclear how valuable or valid these transition patterns are. Moreover, the current discussions made by the authors are insufficient, superficial and sometimes made without citations. For example, the authors state that "bidirectional transitions between striatal and somatosensory/prefrontal RSFC might indicate the presence of bottom-up and top-down processing…" without citing a source. At present, there are numerous studies that interrogated the large-scale effects of optogenetically stimulating striatal, hippocampal and thalamic neurons (Chan et al., 2017; Lee et al., 2016; Leong et al., 2016; Liu et al., 2015; Schmitt et al., 2017). In fact, the authors also characterized the effects of medial prefrontal cortex stimulation (Liang et al., 2015). As such, the authors should make an effort to integrate these pieces of literature or any other relevant works. Note that the literatures suggested here are not exhaustive and that the authors should expand their scope of discussion to better encompass and integrate literature in the interpretation of their findings. 4) Recently, a paper by Xiao et. al investigated the relationship between single neuron spiking activity and brain-wide cortical calcium dynamics (Xiao et al., 2017). They found that thalamic spikes could produce various types of large-scale cortical activity patterns, which are supported by large-scale slow calcium activities (<1 Hz). More importantly, they demonstrated slow calcium cortical activation patterns in the visual cortical and cingulate regions generated from hippocampal spikes. This finding seems relevant to the observations in the present study as the authors also found the transition between hippocampal networks and visual/cingulate networks. Moreover, Logothetis et al. also showed diffuse responses to hippocampal sharp wave ripple events in multiple cortical areas (e.g., visual and cingulate cortices) (Logothetis et al., 2012). With that in mind, how does the present data fit into the current literature landscape? 5) In the Discussion subsection “Nonrandom temporal transitions between RSFC patterns”, the authors state that the results of the present study were consistent with previous studies showing that BOLD signal periodically propagated from lateral to medial cerebral cortex (Majeed et al., 2011; Majeed et al., 2009). This statement seems out of place and erroneous as the findings of the present study did not demonstrate any propagation characteristics. Furthermore, the preceding statements in the same Discussion section addressed the reproducibility of the transitions between RSFC patterns, which is out of the context of the works by Majeed et al. The current report examines the spatiotemporal dynamics of spontaneous brain activity in the awake rat, examining whether transitions between RSFC states are nonrandom. While the paper is timely and of potential interest, the overall novelty is limited given previous reports by the same authors (Liang et al., 2015 Ma et al., 2016) and the restricted scope of the analyses conducted. 1) Imaging awake rats is advantageous (closer to human RSFC, eliminates effects of anesthesia, etc. ), but is more sensitive to head motion. Laumann et al. (2016, Cerebral Cortex) have previously shown that part of the observed dynamics during rest is attributable to head motion. Since motion denoising in this study is lenient (FD exclusion criterion of 0.2 mm as is commonly used in humans) and no global signal regression was applied (which eliminates motion-related artifacts more effectively than ventricle and white matter signal regression alone), it is possible that the non-random transitions between RSFC states are due to head motion. The authors should quantify whether motion events trigger specific transitions. In addition, to more conclusively demonstrate that the results are independent of head motion, the authors can conduct the reproducibility analysis on two sub-groups based on head motion (below an above median FD). 2) The finding of non-random transition is novel and will be of interest to the extended community using RSFC to understand functional organization. That said, many aspects of this study are similar to previous studies. Most prominently: RSFC dynamics in awake rats were reported by the authors (Liang et al., 2015). However, the authors do not discuss the relations between the CAP analysis in Liang et al. to the current findings. In addition, the hub analysis replicates some findings from stationary RSFC analysis (Ma et al., 2016), but some findings differ (areas that appear in only one of the analyses). The authors should elaborate on this issue and explain the differences. 3) A significant shortcoming of this work is relating it to human RSFC. The manuscript would have been much stronger were the authors able to demonstrate that the observed transitions are present in humans and compare the similarities and differences in the dynamics of RSFC. 4) In the Discussion, the authors conclude that RSFC patterns obtained based on these parcels are characteristic and provide a comprehensive representation [to] all ~6000 RSFC patterns. This conclusion goes beyond the data. The number of 40 parcels was chosen by the authors in their previous report (Ma et al., 2016) as an example for a low-dimensionality parcellation, it's possible the high dimensionality parcellation will better represent the ~6000 voxels of the rat brain, especially when taking into account the fact that the rat brain is known to have more than 40 regions. To support their conclusion, the authors need to demonstrate that the high-dimensionality parcellation from Ma et al., 2016 (130 parcels) does not overperform the 40 parcels. 5) The authors fail to cite many recent publications relevant to the current work, including awake rodent fMRI from other groups (e.g., Bergmann et al., 2016; Chang et al., 2016; Yoshida et al., 2016), dynamic RSFC in mice (Grandjean et al., 2017) and spatiotemporal dynamics of intrinsic signals (Mohajerani et al., 2013). Thank you for submitting your article "Temporal transitions of spontaneous brain activity" for consideration by eLife. Your article has been favorably evaluated by Richard Ivry (Senior Editor) and three reviewers, one of whom, Jan-Marino Ramirez (Reviewer #1), is a member of our Board of Reviewing Editors. The following individual involved in review of your submission has agreed to reveal their identity: Ed Wu (Reviewer #2). This manuscript characterizes the transitions of resting-state functional MRI (rsfMRI) functional connectivity (RSFC) network patterns in awake rats as well as humans. The authors use innovative analysis methods including the parcellation of RSFC patterns in an awake animal and the utilization of graph theory approaches. The authors have addressed many of the issues that were raised previously, but we suggest additional revisions that will further improve this interesting study. 1) The addition of human data is important and increases the impact of this study. However, the high correlation values between the 2 subgroups (>0.995) and the fact that significant transitions are very sparse, bring to question the role of statistical thresholding. Since only a small fraction of the transitions are significant, thresholding in-and-of-itself can artificially increase correlation values between subgroups. In addition, thresholding can explain the higher reproducibility in humans relative to rats (human matrices seem sparser). The authors should examine the matrices with all of the raw data (i.e., without applying a threshold). 2) Along the same lines, in order to draw strong similarities/parallels between the human and rat rsfMRI data, the authors included the analysis outcome of the reproducibility matrix of RSFC patterns in humans (Figure 8) to demonstrate that the transition of RSFC patterns are nonrandom and echo the observations found in the awake rat brain (Figure 3). However, the authors should also include additional analysis outcomes that were generated from the human rsfMRI dataset as outlined by the analysis flowchart in Figure 1, such as RSFC pattern transition matrix (Figure 4) and graph theoretical analyses (Figures 5 and 6). It would appear from the flowchart that most of these analyses were already performed in order to generate the reproducibility matrix (Figure 8). Only then, a stronger case could be made by comparing multi-dimensional data to draw similarities between the rat and human brain, particularly in RSFC pattern transitions across time. On a minor note, it may also be of interest to look at the parcellated regions in the human brain using the method developed by the authors as there are numerous recent papers that attempt to improve parcellation procedures (Glasser et al., 2016). 3) The possibility that motion-related artifacts may explain some of the data continues to be a major potential concern, and the authors need to address this concern in a systematic manner. 3a) Based on the relatively modest difference between random and motion-based splitting (0.77 vs. 0.786) the authors claim that the motion-based reproducibility analysis suggested indicates that the high reproducibility in RSFC pattern transitions was not due to head motion. However, this inference is not supported by a statistical test. A permutation test in which the authors calculate reproducibility for many random divisions to subgroups and compare the distribution of correlations would allow this type of inference. In addition, the authors described the results of this analysis only after the regression of seed map similarities, but the supplementary figures should replicate the full Figure 3 and show the results both with and without this regression. Moreover, the authors should describe the FD values (mean+SD) of the subgroups above and below the median FD so the reader will be able to evaluate the data quality. 3b) In their second analysis, the authors examine whether transitions predict head motion. However, this approach is not very sensitive since it tests whether all transitions are caused by motion and not whether motion causes some of the transitions. The authors should test whether transitions are more likely to follow head motion and if such transitions are random across areas or affect specific areas preferentially. 3c) An alternative approach to address this issue is lowering the motion censoring threshold. The current one (0.2 mm) is taken from the human fMRI literature, and might not be suitable for the rat brain. Similar results with FD thresholds of 0.15 mm, 0.1 mm and 0.05mm can indicate that the transitions are motion independent. 4) Along the same lines, no description in the motion scrubbing methods is given for the human data. Did the authors exclude any motion-related artifacts? 5a) In Figure 2, the addition of the distribution of correlation between Seed maps and Average of rsfMRI frames for the 40 seeds will be highly advantageous. Currently, the reader has to visually evaluate 40 seeds in Figure 2—figure supplement 1. Note that parts of Figure 2—figure supplement 1 are cropped (left and lower aspects). 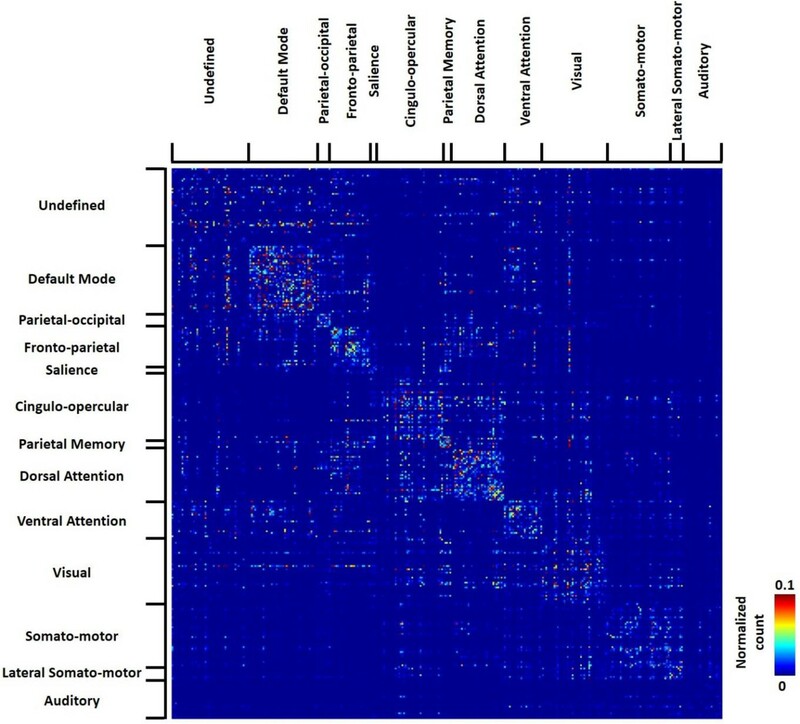 5b) In Figure 4, the authors present a 40x40 matrix. It is impossible to properly evaluate it. Others have used grouping to categories (based on the axes / brain systems) to assist the reader in evaluating which brain systems are characterized by transitions. 5c) Figure 6 depict seed maps that were already presented in previous figures. This redundancy is unwarranted. The authors can plot the hub score of the different 40 seeds and annotate brain systems. 5d) Figure 7 depicts, again, seed maps that were previously shown. The authors need to find a more compact presentation. 5e) Figure 8 depicts the human matrix. If the rat 40x40 matrix was challenging to evaluate, the human 333x333 matrix is virtually unreadable. The authors need to find a visual representation proper for this data via alternative visualization methods (perhaps a scatterplot will be a better way to compare between the 2 subgroups). 6) The authors need to better explain the significance/innovation of the present study, given that previous publications from the authors' laboratory and others have already demonstrated characteristics of RSFC pattern transitions across time (Chang et al., 2016; Liang et al., 2015; Liu and Duyn, 2013; Liu et al., 2015). It is clear that these already published studies did not extensively or exclusively document the transition of multiple RSFC patterns across time, but, the authors need to better explain why the present study is not just an incremental advance. We appreciate the general comment. Regarding the novelty, the present study for the first time characterized the temporal sequences between brain connectivity patterns and showed that spontaneous brain activity did not fluctuate randomly, but followed specific orders. Our study is different from previous dynamic rsfMRI studies, which mainly focused on the spatial characteristics of RSFC dynamics. We believe our results provide new insight into comprehensively characterizing spatiotemporal dynamics of spontaneous brain activity. We agree with the reviewer that temporal transitions of brain connectivity patterns have not been studied in humans, and the addition of human rsMRI studies using the same approach would significantly enhance the impact of this study. To address this issue, in the revised manuscript we have included new results based on human rsfMRI data collected from 812 subjects in the Human Connectome Project (HCP). Briefly, we found that, like our results in rats, transitions between brain connectivity patterns were highly reproducible in humans, suggesting that transitions between characteristic resting-state functional connectivity (RSFC) patterns are nonrandom. These data demonstrated that this feature was well conserved across species in rats and humans, and might represent a general phenomenon in the mammalian brain. Below is the summary of human results added to the revised manuscript. We also discussed the possible reason for higher group-level reproducibility in human data relative to rat data. Taken together, we believe these results suggest that nonrandom transitions between characteristic RSFC patterns are not only a feature in rodents, but conserved cross species in both humans and rats. Such findings highlight the translational utility of the analysis applied in the present study, which might shed light onto comparative neuroanatomy. Our results have also provided new insight into understanding the spatiotemporal dynamics of spontaneous activity in the mammalian brain. We appreciate this comment, and completely agree that motion is a critical confounding factor that needs to be teased out. In the revised manuscript, we added more results to rule out the possibility that reproducible temporal transitions between RSFC patterns were attributed to motion artifacts. Specifically, we conducted two additional analyses. First, we re-evaluated the reproducibility of RSFC transitions between two subgroups of rats with relatively high and low motion, respectively. Rats in the first subgroup all had the motion level below the median, assessed by frame-wise displacement (FD). Rats in the second subgroup all had the motion level above the median. Transition matrices were obtained in these two subgroups, respectively. Comparing these two transition matrices yielded the reproducibility of 0.786 (with the regression of seed map similarities, Figure 3—figure supplement 1), which is similar to the reproducibility assessed based on random grouping (0.77, Figure 3B). In addition, the transition matrices from both subgroups were highly consistent with those in randomly divided subgroups (Figure 3B). These results indicate that the high reproducibility of RSFC pattern transitions was not due to head motion. In the second analysis, we directly compared the motion level between rsfMRI frames involved in RSFC pattern transitions versus those that were not in transitions. All rsfMRI frames we analyzed were categorized into two groups. The first group included frames whose preceding and/or successive frames corresponded to a different RSFC pattern(s). The second group included frames whose preceding and successive frames were the same RSFC pattern. These two groups of rsfMRI frames showed consistent motion levels, quantified by FD values (p = 0.44, two-sample t-test), again indicating that RSFC transitions were not triggered by head motion. These new results have been added to the revised manuscript. We apologize for the confusion. Each (3D) rsfMRI frame was 1 sec (time of repetition = 1 sec). We have clarified this issue in the revised manuscript. We appreciate this comment. The number of time points was the same for each rsfMRI run (540 time points) to ensure the same degree of freedom. In the revised manuscript, we have included the averaged BOLD co-activation patterns from rsfMRI frames that were matched to the reference RSFC patterns (Figure 2 and Figure 2—figure supplement 1), which demonstrated high reminiscence between the BOLD co-activation patterns of rsfMRI frames and the reference RSFC patterns they corresponded to. Again we apologize for the confusing presentation of Figure 5. We have significantly revised the figure to make it easier to understand. Briefly, Figure 5 showed the community structure of the RSFC pattern transition network. In this network, each node represented a characteristic RSFC pattern, and edges between nodes represented significant transitions between these patterns (permutation test, p<0.05, FDR corrected). Our data showed that this network exhibited prominent community structures with nine modules identified, indicating that RSFC patterns belonging to the same modules had a higher probability to transit between each other than RSFC patterns across modules. The corresponding seed regions of RSFC patterns were color coded based on the community affiliations (Figure 5 inlet). Again, we appreciate this insightful and constructive comment. All these studies provide support suggesting the pivotal roles of hippocampus and thalamus in transitions of spontaneous brain activity. We have added more in-depth discussion to the revised manuscript. In addition to the text quoted in response to comment 3. See below for more discussion. We agree with the reviewer and have removed this sentence in the revised manuscript. We appreciate this constructive comment and agree motion is a potential confounder and should be teased out with further analysis. In the revised manuscript, we added more results to rule out the possibility that reproducible temporal transitions between RSFC patterns were attributed to motion artifacts. Specifically, we conducted two additional analyses. First, as suggested by the reviewer, we re-evaluated the reproducibility of RSFC transitions between two subgroups of rats with relatively high and low motion, respectively. Rats in the first subgroup all had the motion level below the median, assessed by FD. Rats in the second subgroup all had the motion level above the median. Transition matrices were obtained in these two subgroups, respectively. Comparing these two transition matrices yielded the reproducibility of 0.786 (with the regression of seed map similarities, Figure 3—figure supplement 1), which is similar to the reproducibility assessed based on random grouping (0.77, Figure 3B). In addition, the transition matrices from both subgroups were highly consistent with those in subgroups randomly divided (Figure 3B). These results indicate that the high reproducibility in RSFC pattern transitions was not due to head motion. In the second analysis, we directly compared the motion level between rsfMRI frames involved in RSFC pattern transitions versus those that were not in transitions. All rsfMRI frames we analyzed were categorized into two groups. The first group included frames whose preceding and/or successive frames corresponded to a different RSFC pattern(s). The second group included frames whose preceding and successive frames were the same RSFC pattern. These two groups of rsfMRI frames exhibited consistent motion levels, quantified by FD values (p = 0.44, two-sample t-test), again indicating that RSFC transitions were not triggered by head motion. These new results have been added to the revised manuscript (Figure 3—figure supplement 1). We would like to clarify that although RSFC dynamics in awake rodents have been investigated in other and our own studies, they are fundamentally different from the present study. The present study for the first time characterized the temporal sequences between brain connectivity patterns and showed that spontaneous brain activity did not fluctuate randomly, but followed specific orders, while previous dynamic rsfMRI studies, including ours, mainly focused on the spatial characteristics of RSFC dynamics. We believe our results provide new insight into comprehensively characterizing spatiotemporal dynamics of spontaneous brain activity. We have clarified this issue in the revised manuscript. Please also see the response to reviewer #1. We completely agree with the reviewer that the manuscript will be significantly stronger with the same analysis applied to human data. In the revised manuscript, we have included new results based on human rsfMRI data collected from 812 subjects in the Human Connectome Project (HCP) using the same approach. Briefly, we found that, like our results in rats, transitions between brain connectivity patterns were highly reproducible in humans, suggesting that transitions between characteristic resting-state functional connectivity (RSFC) patterns are nonrandom. These data demonstrated that this feature was well conserved across species in rats and humans, and might represent a general phenomenon in the mammalian brain. Below is a brief summary of human results but please see more details in the revised manuscript. 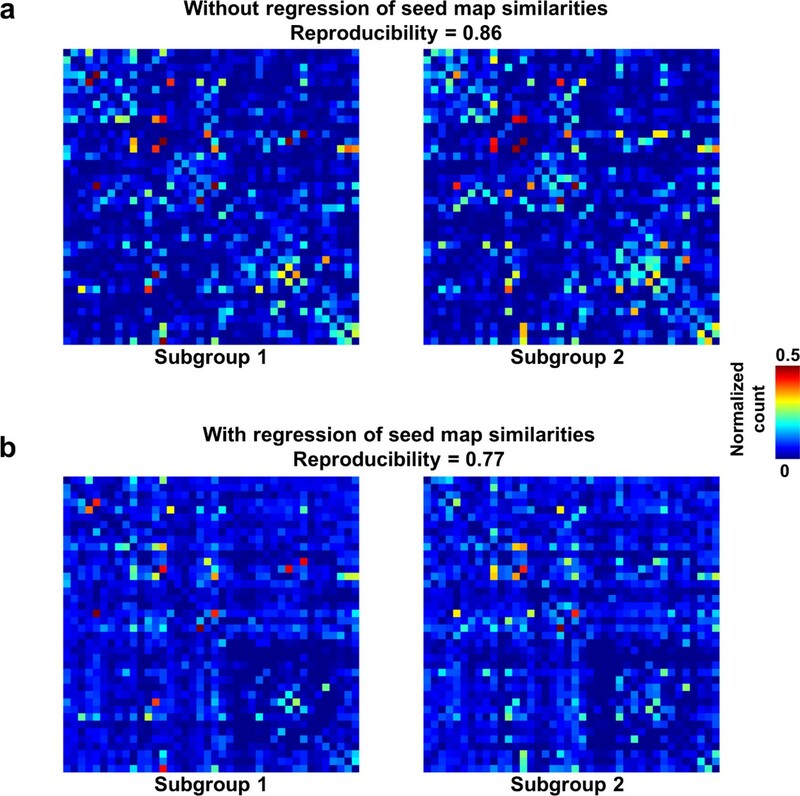 The reproducibility between two subgroups (random split) was 0.9955 (without the regression of seed map similarities), and 0.9954 (with the regression of seed map similarities), respectively. To assess the reproducibility at the individual level, the correlation between the transition matrix of each human subject versus the group-level transition matrix was calculated. The mean correlation ( ± SD) was 0.60 ( ± 0.05). Taken together, we believe these results suggest that nonrandom transitions between characteristic RSFC patterns are not merely a feature in rodents, but conserved cross species in both humans and rats. Such findings highlight the translational utility of the analysis applied in the present study, which might shed light onto comparative neuroanatomy. Our results have also provided new insight into understanding the spatiotemporal dynamics of spontaneous activity in the mammalian brain. We agree with the reviewer and acknowledge that the number of 40 was arbitrarily selected as an example of low-dimensionality parcellation. Similar analysis can be applied using other parcel numbers. In the revised manuscript, we removed the word ‘comprehensive’. We have also pointed out this issue in the section of Potential Limitation. As we stated, corresponding a rsfMRI frame to its most similar reference RSFC pattern is only an approximation for the purpose of investigating spatiotemporal dynamics of spontaneous brain activity. To mitigate this issue, we ensured that the similarity between each rsfMRI frame and its best matched RSFC pattern was statistically significant (p< 10-13). In addition, in the revised manuscript we added averaged rsfMRI frames matched to each characteristic RSFC pattern, which demonstrated high reminiscence between the BOLD co-activation patterns of rsfMRI frames and the RSFC patterns they corresponded to. As a result, we believe the characteristic RSFC patterns selected can well represent rsfMRI frames. We apologize for missing these important references. In the revised manuscript, we have included these papers. We apologize for the confusion. The matrices of human data we showed in the previous submission were unthresholded. They were indeed very sparse, attributed to a much higher number of RSFC patterns involved relative to rat data (humans: 333 RSFC patterns; rats: 40 RSFC patterns), which led to low- (or zero-) probability transitions between quite a lot of RSFC patterns. We did not include any thresholded results in our previous submission due to high computational intensity of permutation tests. However, we included new results from thresholded data (see more details in the response to comment 2). In the revised manuscript, we added new results of human data including RSFC pattern transition matrix (Figure 9) and graph theoretical analysis (Figure 10). The RSFC pattern transition matrix was obtained by applying the same permutation test that identified transitions statistically above chance. We found that, like rats, RSFC pattern transitions in humans more frequently occurred within the same brain system, but considerable cross-system transitions were also observed. We further calculated the hubness of individual nodes in the human RSFC transition network, and found multiple hubs in separate brain systems including default-mode, cingulo-opercular, dorsal attention, ventral attention, fronto-parietal, parietal memory and visual networks. Intriguingly, virtually all hubs were integrative networks (with the only exception of the visual network) that are known to integrate information from multiple other areas (e.g. sensori-motor systems). Our data suggest that these integrative networks played a pivotal role in human RSFC pattern transitions. These findings highlight the translational utility of the analysis applied in the present study, which might shed light onto comparative neuroanatomy. Our results have also provided new insight into understanding the spatiotemporal dynamics of spontaneous activity in the mammalian brain. Unfortunately, our computers do not have enough memory to conduct the parcellation of the human brain using the same method we developed in the rat due to a much larger matrix size required for the human data. We appreciate this constructive suggestion. In our revised manuscript, we added new results of a permutation test to examine whether the reproducibility using motion-based group division was statistically different from that based on random divisions. Specifically, we repeated random divisions to subgroups 10000 times. Mean reproducibility ( ± SD) across all 10000 trials was 0.876 ( ± 0.010) and 0.791 ( ± 0.017) without and with regression of seed map similarities, respectively. Figure 3—figure supplement 2 showed the distribution of the reproducibility between randomly divided subgroups across all trials. This data demonstrated that the reproducibility using motion-based division to subgroups was not statistically different from the reproducibility based on random division regardless whether RSFC pattern similarities were regressed out (p = 0.75) or not (p = 0.67). In our revised manuscript (Figure 3—figure supplement 1), we reported the reproducibility results both with and without regression of RSFC pattern similarities. We also reported the FD values of the subgroups above and below the median FD as suggested. The mean ( ± SD) FD of the below-median subgroup was 0.037 ( ± 0.024) mm, and the mean ( ± SD) FD of the above-median subgroup was 0.054 ( ± 0.033) mm. We agree that the analysis mainly tested whether all transitions are caused by motion. To further address this issue, in the revised manuscript we measured the head motion (i.e. FD) during each RSFC pattern transition and compared the mean head motion level for each transition sequence and the occurrence count of this transition sequence. Specifically, we calculated the mean FD for transitions between every two RSFC patterns. This calculation yielded a 40 × 40 matrix, in which each element quantified the mean FD for each transition sequence (e.g. element (i,j) of this matrix measured the mean FD for the transition from RSFC pattern i to RSFC pattern j). Our data showed that the correlation between this transition FD matrix and the RSFC pattern transition matrix was minimal (r = -0.034), suggesting that the mean head motion level during each transition sequence did not predict the occurrence count of this transition sequence. This result further supports that RSFC pattern transitions were independent of head motion, and RSFC transitions did not follow head motion. We agree that showing robust results for a more stringent censoring threshold will further strengthen the study. In the revised manuscript, we reanalyzed our data using a more stringent censoring threshold (FD < 0.1mm). At this threshold, very similar RSFC pattern transition matrices were obtained. The correlations between the RSFC pattern transition matrices at FD < 0.1 mm and those at FD < 0.2 mm were 0.83 and 0.88 with and without regression of RSFC pattern similarities, respectively, suggesting that our results were robust and insensitive to the motion censoring threshold applied (Figure 3—figure supplement 3). We did not use an even more stringent threshold at FD < 0.05 mm because significant portion of data were discarded at this threshold. The ICA+FIX pipeline (Griffanti L et al. 2014; Salimi-Khorshidi G et al. 2014) was used for cleaning head motion, and this process was already performed in the HCP pipeline in ‘HCP extensively preprocessed 3T rsfMRI data’. We have clarified this issue in the Materials and methods section in the revised manuscript. 5a) In Figure 2, the addition of the distribution of correlation between Seed maps and Average of rsfMRI frames for the 40 seeds will be highly advantageous. Currently, the reader has to visually evaluate 40 seeds in Figure 2-figure supplement 1. Note that parts of Figure 2—figure supplement 1 are cropped (left and lower aspects). In the revised manuscript, we have added the quantification of similarity between seed maps and average of rsfMRI frames, measured by their spatial correlations, for all 40 seeds. We have also fixed the cropped parts of Figure 2—figure supplement 1. We have added axes in Figure 4 to indicate the brain system that each row and column belong to. We have revised the figure as suggested. We have changed the presentation of Figure 7 by replacing the seed maps with nodes that include the pattern number shown in Figure 2 and the brain system of the seed (Please see Figure 7 in the revised manuscript). We have added scatterplot panels to the figure as suggested. We have also added more annotations to better present the figure. 6) The authors need to better explain the significance/innovation of the present study, given that previous publications from the authors' laboratory and others have already demonstrated characteristics of RSFC pattern transitions across time (Chang et al., 2016; Liang et al., 2015; Liu and Duyn, 2013; Liu et al., 2015). It is clear that these already published studies did not extensively or exclusively document the transition of multiple RSFC patterns across time, but the authors need to better explain why the present study is not just an incremental advance. We have better clarified this issue in the revised manuscript. All these previous studies in this line, including ours, focused on revealing the spatial organization of RSFC patterns that were non-stationary, but none of these studies examined the temporal relationship between these RSFC patterns. In other words, previous studies only established the existence of RSFC temporal transitions, but it was unclear whether these transitions were random or organized in an orderly manner. The innovation of the present study is to elucidate the temporal organization of RSFC pattern transitions in both humans and rats. We found that temporal transitions between spontaneous brain activity were not random, but follow specific orders, and this result was consistent in both awake rats and humans. The present study was partially supported by National Institute of Neurological Disorders and Stroke Grant R01NS085200 (PI: Nanyin Zhang, PhD) and National Institute of Mental Health Grant R01MH098003 and RF1MH114224 (PI: Nanyin Zhang, PhD). Part of this research was conducted using the high-performance computing resources provided by the Institute for CyberScience at the Pennsylvania State University (https://ics.psu.edu). Human data were provided by the HCP, WU-Minn Consortium (Principal Investigators: David Van Essen and Kamil Ugurbil; 1U54MH091657) funded by 16 NIH Institutes and Centers that support the NIH Blueprint for Neuroscience Research; and by the McDonnell Center for Systems Neuroscience at Washington University. Human subjects: This study only involves analysis of human imaging data that were publicly available (Human Connectome Project). No informed consent was obtained. The study has been approved by the IRB of the Pennsylvania State University (STUDY00005665). Animal experimentation: This study was performed in strict accordance with the recommendations in the Guide for the Care and Use of Laboratory Animals of the National Institutes of Health. All of the animals were handled according to approved institutional animal care and use committee (IACUC) protocols (#43583-1) of the Pennsylvania State University.